Free Recording and Production of your performance when your group sells 75 CDs or more. When your group sells 100 or more CDs you start making a profit! 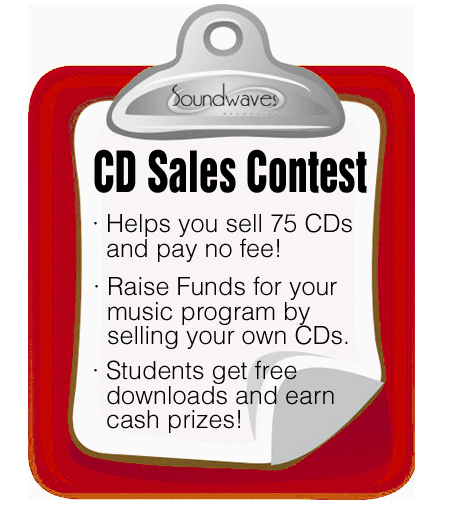 To help you reach your goals and to raise funds for your music program or group Soundwaves offers the CD Sales Contest. Unlike other fundraisers, participants need only to sell several CDs each to start raising funds. The top three participants who sell five or more CDs receive a $20 cash prize. CD sales start on the day the Director hands out the sales forms and ends when the Order Forms are collected. Once complete, Soundwaves will send the CDs to your group and participants can use their Order From to fulfill the orders.